March Newsletter Released To Subscribers Monday! Anyone on the subscriber list as of 8AM Monday (CST) will receive it by email later that night. I’ll release it to everyone else next Friday via the blog. So sign up for early delivery now by clicking here! Syncope accounts for 1-2% of all ED visits, and is a factor in some patients with blunt trauma, especially the elderly. If syncope is suspected, a “syncope workup” is frequently ordered. Just what this consists of is poorly defined. Even less understood is how useful the syncope workup really is. Researchers at Yale retrospectively looked at their experience doing syncope workups in trauma patients. They were interested in seeing what was typically ordered, if it was clinically useful, and if it impacted length of stay. Most of this testing was normal. About 3% of cardiac enzymes were abnormal, as were 5% of carotid imaging and 4% of echocardiograms. Important! Of the patients who underwent an intervention after workup, 69% could have been identified based on history, physical exam, or EKG and did not depend on any of the other diagnostic tests. Bottom line: Don’t just reflexively order a syncope workup when there is a question of this problem. Think about it first, because the majority of these studies are nonproductive. It is not needed routinely in trauma patients with syncope as a contributing factor. Need for intervention can usually be determined by history, exam and EKG performed in the ED. And be sure to include the patients primary doctor in the loop. Reference: Routine or protocol evaluation of trauma patients with suspected syncope is unnecessary. J Trauma 70(2):428-432, 2011. Landmarks – The usual anatomic landmarks (clavicle, first rib) may be out of place or non-palpable, making the procedure technically more difficult. Vessel location – The actual location of the vessels may have changed due to hematoma formation. This will decrease the likelihood of successful cannulation. Aspiration of blood – The usual way the trauma professional identifie if they have entered the vein is free aspiration of dark blood. A fresh fracture hematoma looks and feels exactly the same, and may be aspirated into the needle just as easily. So you think you’re in the vein, but you’re not. Contamination risk – There is the possibility that you may contaminate the fracture hematoma, leading to bone healing complications. What if the fracture side is the lesser of two evils? Let’s say the contralateral side has even more severe injuries. 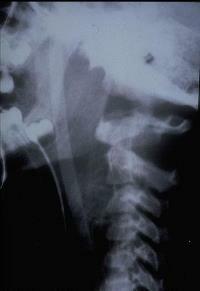 I recommend abandoning the subsclavian approach on either side and choosing another site, like the internal jugular. 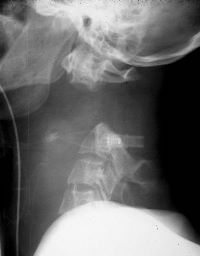 What if there’s a pneumothorax (occult or obvious) on the side of the clavicle fracture? Traditionally, we would choose that side for the line, because it may need a chest tube anyway and it removes any worry about causing a pneumothorax from the insertion procedure. In my opinion, that’s not a good enough reason to struggle with the four issues listed above. Bottom line: Don’t even consider inserting a subclavian IV on the side of a clavicle fracture. The odds are stacked against you being successful, and there are essentially no benefits. Juice to squeeze ratio equals zero! Hat tips to Corey Heitz and wasatch for their comments! Related post: What do you think? Subclavian IV and clavicle fracture?